?Enhance your community-based safety campaign with help from the free injury prevention display loan program! 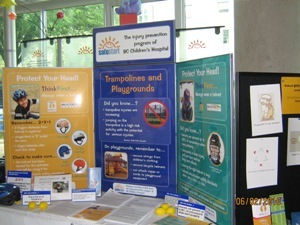 The bright, colourful panels are designed to attract families with key messages and photographs addressing leading injuries among young children. Please note: organizations, borrowing the display, are responsible for either picking up the display from and returning it to BC Children's Hospital or for shipping costs to and from the event location. A deposit of $100 is required to encourage responsible use. Your deposit can be made by cheque, VISA or MasterCard. Cheques are either returned or voided/destroyed when displays are returned in good condition. Display venues can include indoor or outdoor events, shopping malls, conferences, baby clinics and health fairs. The injury prevention display is now borrowed through the BC Injury Research and Prevention Unit. Print and complete the booking form and email it to dleung4@cw.bc.ca or call 604-875-3776.